For a growing portion of users, mobile is no longer a secondary, fill-in-the-gaps channel, but the primary way they go online. This is especially true for the Millennials (aka Gen Y). At 76 million strong in the US alone, Millennials are the largest generational market since the Baby Boomers. 85% of phone owners between 18 and 29 use their phones to go online, and 50% of those users go online mostly on their phone. Looking beyond young adults, 34% of all mobile internet users are “mobile-mostly.” For this growing number of users, the mobile internet is the internet, and mobile is the only way marketers are going to reach them online. Marketers have been trying hard to keep pace with these changes. In the US, almost $10.5 billion will be spent on mobile marketing in 2013, a figure set to roughly double to $21 billion by 2015. The reason is obvious: we have to reach our audiences where they are. However, many marketers today still have a limited view of mobile. Many think of mobile only in terms of tools (such as QR codes and mobile lead retrieval at tradeshows) or techniques (such as mobilizing existing websites and acquiring leads via SMS). It’s easy to lose sight of mobile’s larger strategic role in our engagement with prospects and customers. Marketers should stop struggling to catch up with the mobile stampede, and learn to lead the pack. We should be leading mobile users to their goals, engaging and converting them along the way. We should also be demonstrating best practices within our organizations and industries. We need to stop treating mobile as an add-on or side project; we need to think of mobile first. For more information, be sure to sign up for our upcoming webinar, Mobile First: 5 Tips for Integrating Mobile with Marketing Automation. 1. Don’t aim for a one-size-fits-all approach. Mobile is different. This may seem obvious, but many have tried to treat mobile like any other endpoint. But you can’t deliver all of the same content, structured in the same way, to all users. Given the variety of devices that your customers use, and the variety of usage patterns between mobile and PC users, this approach won’t work. Frequent. The average smartphone user checks their device 150 times a day. Quick. Interactions on mobile devices are on average 56% shorter than on PCs. Spontaneous. The most common activities on mobile devices are much more likely to be unplanned, spur-of-the-moment interactions. Simultaneous. Increasingly, people interact with multiple devices during the course of the day, often at the same time. In such situations, at least one of the devices is almost certainly a phone or tablet. Actionable. A Nielsen/Google joint study found that 3 out of 4 searches on a mobile device lead directly to a visit, call, or purchase. 41% lead to a conversion, and 55% of those conversions happen within 1 hour. Mobile users are disproportionately looking for info they’ll act quickly on. 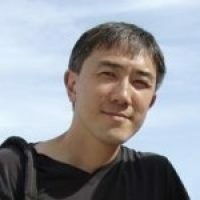 On ‘found time.’ Mobile interactions often happen in situations where users previously couldn’t be informed, connected, entertained, or productive. Users go online with their phones while waiting, on the go, away from other devices, or in physical or social contexts that push users toward short, partial-attention interactions. These characteristics don’t all apply all the time, of course – but more often than not, at least one of them does. The net effect has been memorably summed up as “one thumb, one eyeball.” Quick, ad hoc, split-attention interactions are quite distinct from the usage patterns typical of desktop and laptop PC use. These differences argue against trying to reach users on all devices with exactly the same message, organized in exactly the same way. Sometimes, one size just does not fit all. 2. Don’t just mobilize; mobile-optimize. Because one size may not fit all, being a leader on mobile is about more than just mobilization. 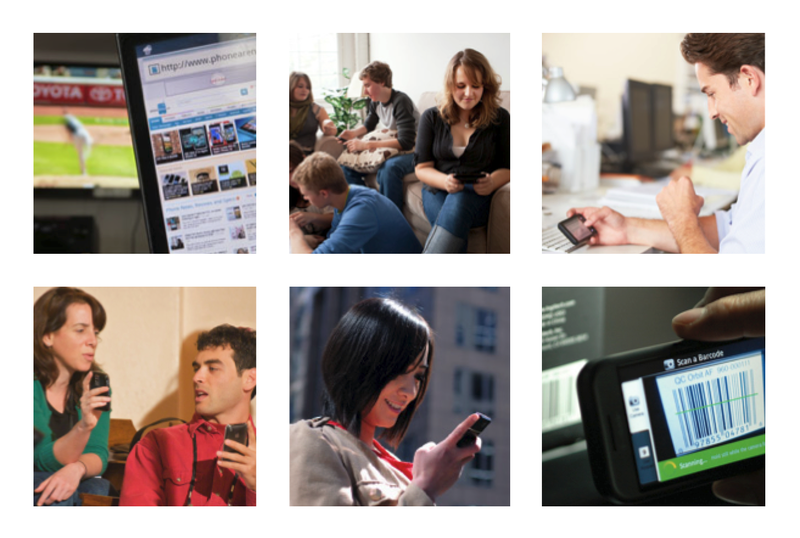 Mobilization means adapting existing websites and strategies to fit mobile devices. Often, the more strategic approach is mobile optimization – crafting strategies, content, and experiences that are uniquely meaningful and effective on mobile devices. If you think of your messaging as a meal, then mobilization can be thought of as a take-out box: the full meal, cut up and repackaged to go. 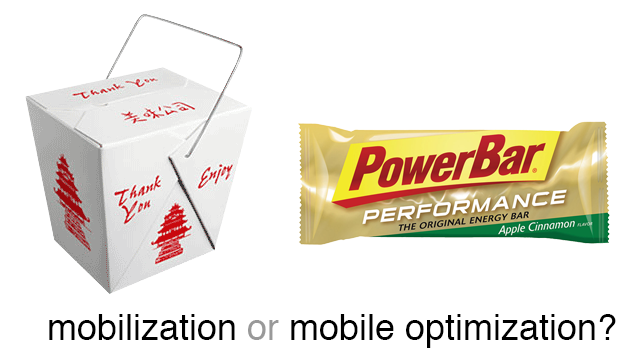 Mobile optimization can be thought of as an energy bar: a high density package of useful content, designed from the ground up for convenience, digestibility, and one-handed usability. Each has its place, but sometimes mobile optimization is the more effective approach. 3. Use technology that gets you to market, not technology that gets in your way. Because of the complexity and rapid pace of change in mobile technologies, those with the message – including content creators, strategists, and marketers – have been powerless to get that message on mobile channels on their own. Instead, they’re reliant on IT staff, developers with very specific (and expensive) mobile expertise, or outside vendors. Recently, new tools have emerged that allow non-technical businesspeople to quickly and easily create and update media-rich, mobile-optimized websites and apps on their own. Such tools allow much faster time to market, and more nimble responses to the market. Content creators can now quickly launch timely mobile email campaigns, or ensure that mobile sites and apps can be updated at a moment’s notice, all without the help of developer or IT resources. 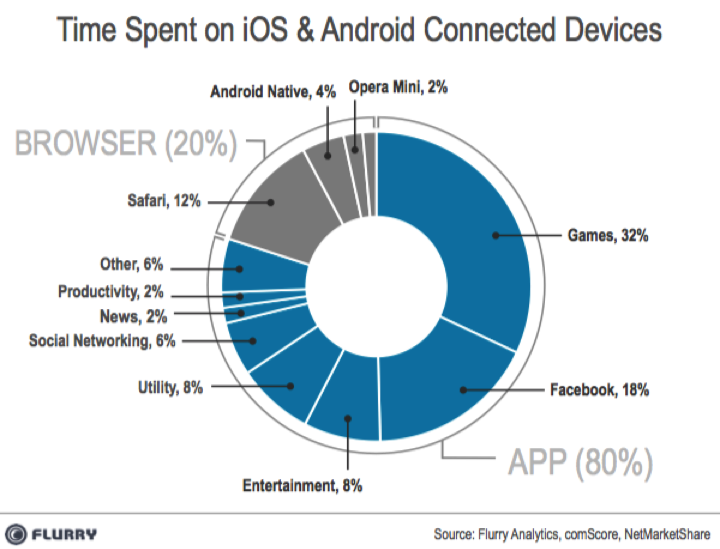 A 2013 study from Flurry Analytics shows that iOS and Android users spend 80% of their time in native apps. This percentage is growing year by year. What’s more, users’ engagement with native apps (measured by how often they use the apps over time) has also been increasing. It’s easy to see why. Native apps offer high-touch abilities such as push notifications, access to advanced device capabilities, live widgets on Android home screens, and deep integration with the user’s personal data. For these and other reasons, our mobile audience is choosing to spend their time in native apps. If we want to reach them most effectively, native apps need to be part of our mobile strategy. 5. Measure, capture, and convert. Every technology change wave has enjoyed a honeymoon period, during which simple reach and engagement were reason enough for companies to plunge in. When the honeymoon is over, these advancements have to justify their worth. This is especially true in the marketing world. Before we fully adopt new technologies, we need to know their measurable marketing value. Mobile is at that inflection point. It’s gone from a fringe novelty to a basic cost of doing business, and increasingly, businesses want mobile to justify its cost. In mobile marketing communications, that justification comes through integration with your website analytics, SFA, CRM tools, and your marketing automation system. The essential mobile marketing toolbox must include the ability to integrate both your mobile website and native apps with such systems. The ideal toolbox should include ways to follow identified users across devices and platforms as they go through their multi-device lives. One example of an organization applying all five of these best practices is Algonquin College. Algonquin leveraged rapid-publish mobile software, in conjunction with Marketo, to develop and continually update content-rich communications with prospective students. To learn more and see their system in action, join us on October 2nd for our Algonquin-Marketo webinar: Mobile First: 5 Tips for Integrating Mobile with Marketing Automation.